Kormilda College's cookery students enjoyed a special treat with Steve Sunk when they all cooked up a storm for the Taste of Harmony celebrations in Darwin. As well as the introduction of the Cook for the Family program they enjoyed the experience of preparing simple and tasty meals like fish laksa, kangaroo fillet with mushrooms, home-made damper scones, chicken curry and chilli beef casserole. This was a day when many teachers visited the cookery classroom to see how the kids were getting on and, when the meals were served, several classes came in to help polish off the huge amount left over. Everyone ate well that day. 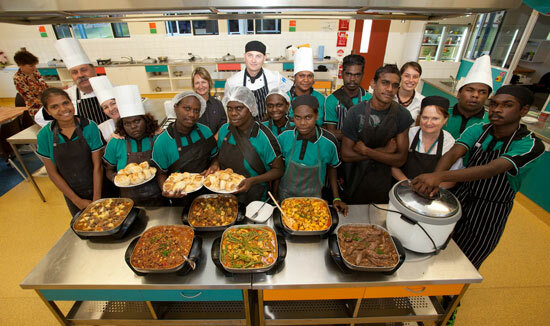 The 12 Yolngu students from East Arnhem Land, have learnt how to prepare food from around the world. Together with Steve they made dishes such as Spanish Paella, Japanese sashimi, french omelete and also simple meals such as bully beef and vegetables, fresh fish and salad and soups. The excitement of smelling cinnamon sticks from Sri Lanka and fresh herbs broadened their food experience and gave them the inspiration to cook for therir families over the weekends. The time spent together was a feast of food and conversation. The time spent eating together across cultures allowed for sharing of skills, knowledge and stories. The students were keen to tell stories of hunting, and fishing and cultures while listening and learning to other stories. Full hearts and full stomachs. A week later, the same students plus a few others, worked together to cook a lunch for 20 guests and staff. They cooked up a hearty minestrone soup, nasi goreng with fried trevally and had chocolate cake for desert. With the expertise and kitchen craft taught by Steve Sunk, the kids jumped straight into the kitchen, remembering to wash their hands and set up their work stations. They used terminology such as batons, small dice, rough chop and saute. They made the chocolate cake from scratch with no assistance. All of these meals they will be able to prepare for their families at home. The parents, grandparents and carers sat at tables and were served by the students and enjoyed a healthy three course meal.